We set our clocks back Sunday (though some of you reading this may never change your clocks and others may change yours on different dates). This artificial change brings light earlier in the morning but also summons darkness earlier in the evening. Is this a human attempt to control the uncontrollable nature of time? Is it part hubris for humans to attempt to wrangle obedience from the sun and force it to rise and set on our command? I used to love this weekend every year when I was younger. I relished the extra hour of sleep and waited all day to change my clocks. Each time I looked at the clock, I’d celebrate a small triumph over time: “Hah!” I would think, “I really have an extra hour,” when in fact I only had the same amount of time as always. I could pretend there was a 25-hour day in the fall and ignore the required 23-hour day in the spring to balance the truth that we all only get 24 hours in every day, no matter how much we try to cajole and shift and control time. Maybe in youth, I walked in a different sort of light, didn’t need the sunlight as much as I do now, wasn’t as influenced by the shorter days and the lessening of the light. As I age, this day and the week that follows grow more difficult for me. It’s like a week of vertigo for my brain as I attempt to adjust to a new pattern of light and dark in life. The dog gets antsy in the afternoon, thinking I’ve forgotten her walk and dinnertime. My husband runs mostly in the dark—whether he runs before or after work—and all too soon, he’ll also leave for work in the dark and return in the dark. I’ve heard from several friends recently, bemoaning the coming dark in this way: “Only the Christmas lights make it better this time of year, but then …” They all seem to trail off at the same point, with an agonized look toward post-Christmas and winter’s dark. This is a hard change. 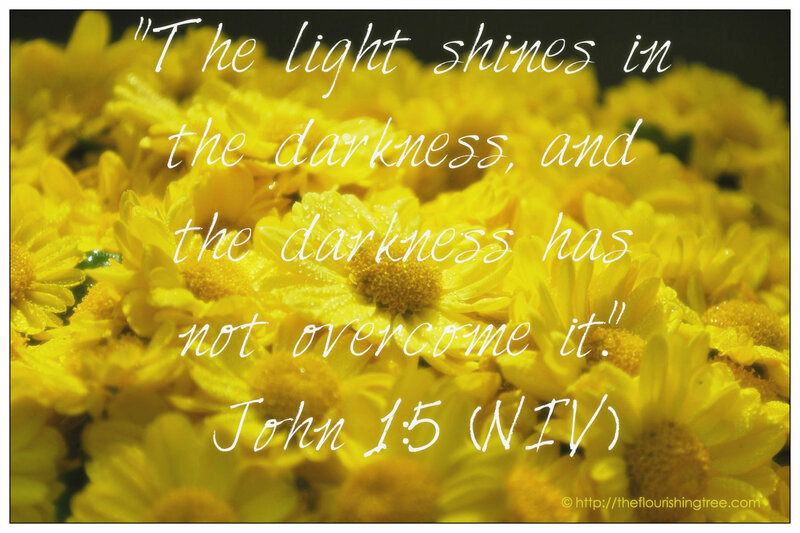 I especially love the NIV translation of this verse because it’s about light (and God) winning, light equaling strength, light defeating the darkness and by extension, good defeating evil. I’ve been pondering this balance of light and dark more than usual lately as my move looms ever closer. Each goodbye is tinged with both light and dark, but I like to think that the joy of each friendship outweighs the dark sadness of saying a temporary farewell. I also fret about the light in my new home. Will there be less light in the winter there? And if so, how will it affect me? But the simple truth is this: I am not in control of the darkness and the light. I have to trust that the light can and will overcome the dark. This mum positively shimmered in place. I would walk by a window and glimpse a golden halo through the glass, the mum defeating darkness and mimicking the sun’s own light. Check out this Washington Post article about the politics of time. The article also provides a map of countries that practice the time switch. If the time change itself hasn’t already made you dizzy, this list of countries and their decisions about time zones and changes may leave you feeling a little off kilter. And if you’re looking for a defense of the dark, this is a beautiful read. My favorite line: “Surrendering to the dark was my only hope of making peace with the light.” Because, after all, even the light can overwhelm us somedays. So how about you? How are you adjusting? Does “falling back” affect you? 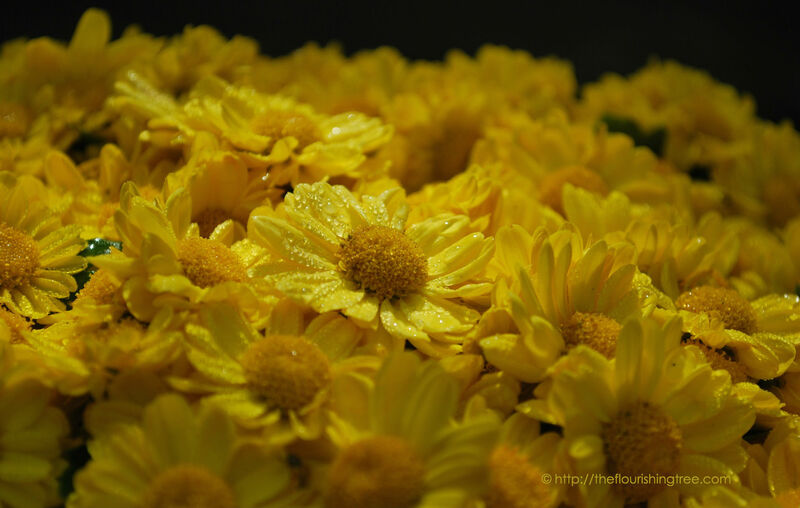 This entry was posted in flourishing tree and tagged darkness, Fall back, golden mum, John 1:5, light, politics and time, time change by hopesquires. Bookmark the permalink. I am so happy to be back on standard time……I finally get a good night’s sleep. Daylight Savings Time makes me feel like there are not enough hours of darkness before bedtime, so I stay up too late, go to sleep restless, and wake up tired. I’m for joining the Turks and Caicos. Hi Sweetie……nice article. In fact, they are all so good. Guess who??!! Thanks for dropping by! It’s funny that you say you sleep better now. I always feel like I sleep better in the spring and summer. I love the article you suggested http://www.washingtonpost.com and I had no idea Brazil, china, India and Russia were so far from solar time! I loved the line about “enjoying a sunset at midnight!” Too funny. I like to look overhead at noon to see the sun directly above and and know it’s noon – seems pretty natural to do it that way! Midnight does seem late for sunset. From one of the links, I see that Turks and Caicos is getting it right: beginning in 2015 they will go to DST permanently. You get your extra hour of daylight and have happy clocks, too. I think that’s a brilliant idea!